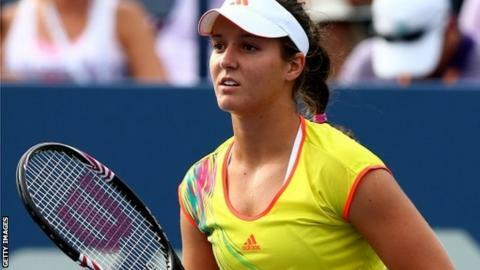 Laura Robson became the first British woman for 22 years to reach a WTA singles final with victory over Sorana Cirstea in Guangzhou, China. The Londoner, 18, beat the Romanian third seed 6-4 6-2 to match Jo Durie's 1990 run to the final in Newport, USA. Robson will play Chinese Taipei's Su-Wei Hsieh on Saturday after the world number 53 beat fourth seed Urszula Radwanska 6-1 3-6 6-0. Sara Gomer was the last Briton to win a WTA singles title in 1988. "1990 is a long time ago, it's about time it got broken. I don't think I need to give her any advice for the final, she's on a roll at the moment. She's just got to enjoy the moment and battle hard, that's all you can do out there. A lot more hard work will come on the practice courts. I wish her very good luck." The Briton, who won the junior Wimbledon title as a 14-year-old, employed new coach Zeljko Krajan after the Olympics and has since gone on the best run of her developing career. After beating seventh seed Shuai Peng and second seed Zheng Jie on her way the semi-finals in Guangzhou, Robson had too much for third seed Cirstea on Friday. The teenager survived three break points in the opening game of the match before taking charge, building a 5-1 lead, only for Cirstea to find her range and blast her way back to 5-4 down. Her hard work was undone, however, as Robson finally earned two set points on the Romanian's serve and converted the first with a thumping forehand winner. A heavy backhand return into the corner set up a break point early in the second set and the inconsistent Cirstea netted a forehand to put the Briton 2-0 ahead. Robson looked to have done enough when she won an epic sixth game of the set, converting her sixth break point to move 5-1 clear, but once again failed to serve out the set at the first time of asking. It did not signal a prolonged fightback from Cirstea, however, with Robson attacking the Romanian's serve to break for the sixth time in the match and wrap up victory after one hour and 30 minutes. "I'm feeling good, I played well today," Robson told the WTA wesbite. "Sorana is a really tough player to play because she plays so aggressive and hits so many winners. "I kept trying to take the ball early to take the time away from her and give me more of a chance in the rallies." The Briton lost her only previous match against Hsieh, and added: "She plays quite differently from most of the players and I need to be ready for this. "I played her once before last year in Japan and I lost, and all through the match I could never tell what shot she was going to hit next."